Europe’s waterway heritage – part of the ‘cultural infrastructure’. Support for the use of Europe’s waterways for cultural projects and ‘protection and preservation of cultural heritage’ is highlighted in the policy recommendations developed throughout the WF project. The full list of policy recommendations can be viewed here. The Waterways Forward partners noted that EU funding is already allocated specifically for protection and preservation of cultural heritage. Europe’s Waterway heritage is part of the ‘cultural infrastructure’ of Europe, contributing to economic attractiveness, job opportunities and quality of life. Recommend increased recognition in EU policy for the unique cultural heritage of Europe’s waterways and to build on this heritage as a driver for economic growth and developing community capacity e.g. through tourism (linked to the EU tourism framework) regeneration of waterfronts or creation of a “sense of place”. 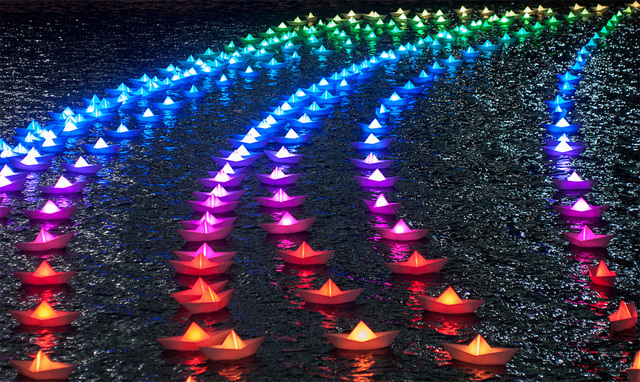 This year’s art installation at Canary Wharf in London’s Docklands has been titled Voyage by its creators Aether and Hemera, Claudio Benghi and Gloria Ronchi. 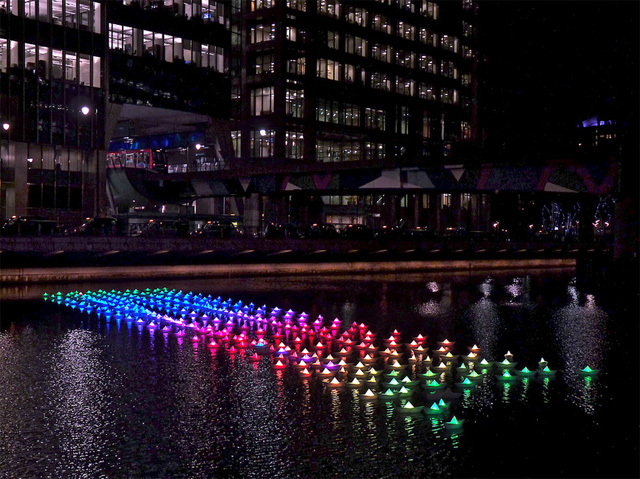 Every year an art installation at Canary Wharf is put on as part of the area’s award winning Winter Lights programme of temporary and permanent visual arts. 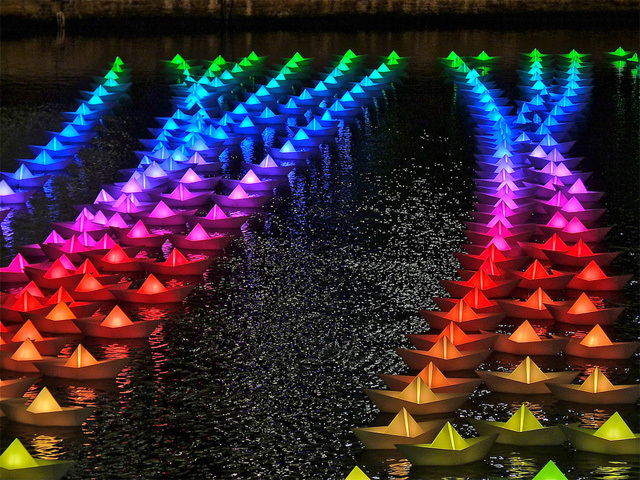 The boats in this year’s display feature a dynamic system whereby passersby can alter the colour of the illuminations on their mobile phones, meaning that you can play an integral part of the artwork. This year’s display is set to be one of their most ambitious yet, and the interactive approach will get attendees more involved than ever so be a part of the action and head to the latest art installation at Canary Wharf. Photographers Sean Batten and Ian Docwra . Often the history of European waterways (in Lombardy we have the Navigli system) is interwoven with that of the adjacent Regions. Over the course of history, this hydraulic and technical complexity determined the structure of settlements and the rural organization of the countryside and the urban planning, playing a decisive role in the economic development of each region. In Lombardy, for example, countless homes of the nobility found an ideal location along the banks of the Navigli and contributed to the development of the canals themselves and the historic centres which sprang up along in the surrounding area. These historic signs, together with the marvellous natural environment, are still nowadays treasures to be safeguarded and further developed for tourism and culture, even for economy. So what I would like to focus is the importance of the actual opportunity to revalue the cultural heritage of the navigli and other European waterways and preserve their natural background. In fact the Navigli System is endowed with landscape and environmental resources that the area offers and which make up the identity of the Region. These elements must be recognized for the valuable asset they offer and safeguarded against the factors of risk such as deterioration, neglected conservation and inappropriate use of the surrounding area. And the same can be claimed for other historical canals. The relational fabric which has been woven between the historical/testimonial values, the natural features and the farming tradition gives the area, crossed by the Navigli System, a complex environmental identity which is clearly perceived and deeply felt by the local populations. The labour of man, which over the years has enriched the canals and their surroundings, has turned this complex system into something that can be considered a work of art, that is according to the current understanding of the term; something which bears witness to the genius and skilled workmanship all over the centuries. From this perspective the Navigli System may be considered a part of the cultural heritage and regional identity which should lead to a compatible use of the canals themselves improving, at the same time, the standard of living. Together, the European waterways are a European cultural infrastructure and European cultural routes to be explored by enthusiasts and lovers of waterways giving an opportunity to enhance the development of those regions. It is also essential to analyze the interests of stakeholders in order to develop policies of governance and plan instruments in such a way as to create opportunities (in the heart of Lombardy or another European area) for smart and sustainable development of adjacent regions and waterfront and improvement in the standard of living.